Sign holds 4 different graphics for greater impact. Unit comes with protective lenses to keep graphics dust-free. Constructed out of sturdy metal for secure placement. 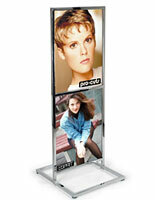 Do you need a metal poster frame that can display several different images in one common stand? Are you working with a limited amount of floor space? 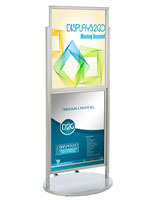 This metal poster frame is a popular choice for displaying four different graphics in one display. 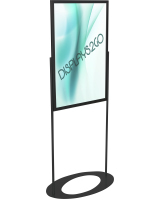 The black aluminum frame is simple in design, yet is extremely durable. 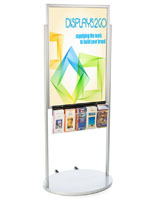 Place this metal poster frame that holds (4) 22" x 28" signs near an entry way or in a lobby to promote your products and services. The open-top design allows for quick and easy change outs. 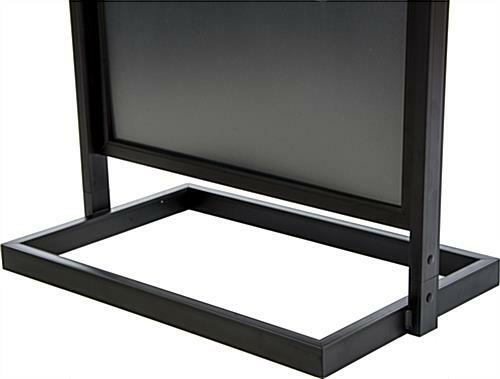 To update this metal poster frame, simply place the 22" x 28" prints between the non-glare protective lenses and slide down into the groove on the top and bottom sections of the frame. The maximum thickness is 1/8" which enables users to utilize more durable materials to make graphics last longer. 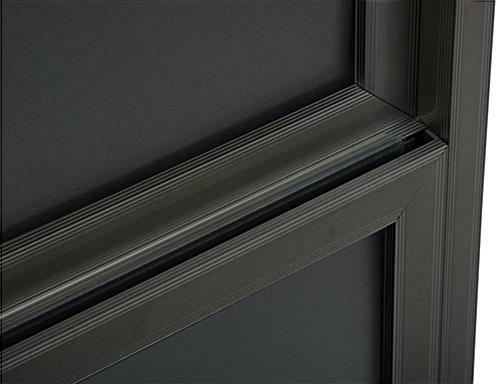 Each metal poster frame also features a middle support panel to ensure signage doesn't bow or wrinkle inside the framing. 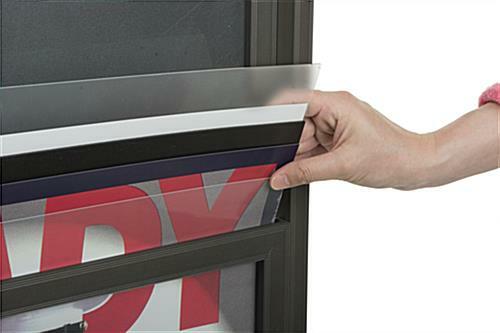 This bonus feature allows users to place thinner print material in this unit without having to worry. 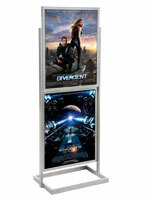 The metal poster frame with a black finish ships unassembled. 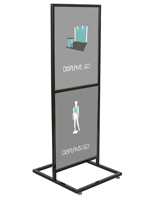 One person can easily assemble this sign stand in a matter of a few minutes. Each metal poster frame is shipped with a complete set of assembly instructions. 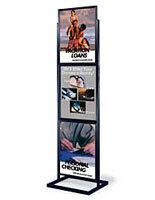 This freestanding sign display is often seen in bank lobbies, shopping malls and large convention centers. 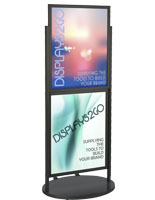 This metal poster frame is an effective marketing tool used by businesses all around the world. The shipping box had a big hole torn in it, but the display unit was fine. The instructions weren’t clear about how to put it together, but we figured it out. Quality is decent and will allow us to make use of POP pieces in our lobby. We're sorry to hear the instructions were not easy to follow, Jereme. We will review for clarity. Thank you for the feedback! 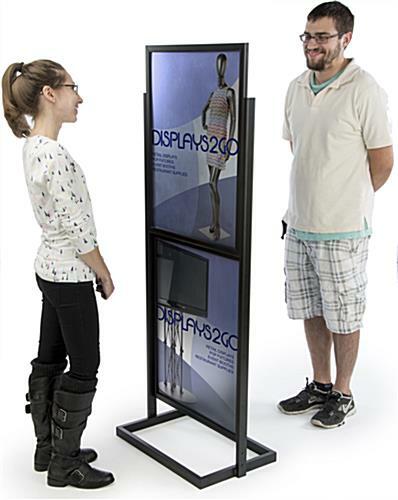 We're happy to hear that the overall stand will work well for you! We purchased two of the regular double sided poster that holds 2 graphics. This dual option is really nice, like the quality as usual, looks so professional in our lobby.